After losing by just two runs last week, New Norfolk I again missed out on its first victory of the season after close one against St Aidan's at Tynwald Park. Needing five to win off the last ball of the match, the Red Caps couldn't quite get there, but it was a gallant effort by the team which has had its four matches against the top teams in the competition thus far. Batting first, St Aidan's made 8/262 off its 50 overs. Jason Rigby took 2-44 off 10 overs and Nathan Eiszele 2-62 (10). In reply the Red Caps gave it their all, finishing 9/258 off 50 overs. The New Norfolk batsmen showed plenty of fight. Stewart Rice batting at number nine played very well and finding form making a well put together 66. Nathan Eiszele did just as well making 65 while up-and-comer Cody Neads at number seven hit up an excellent 51. Another frustrating result for the boys, but I'm sure that first win is just around the corner. 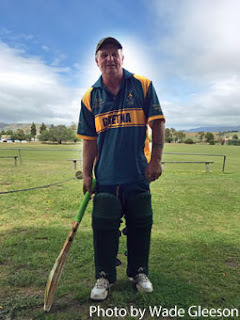 Molesworth I went down to the Knights by three wickets at Boyer Oval. Batting first, Molesworth made the defendable total of 10/179 off 45.4 overs. Khan Stokes made 45 batting at number seven hitting five fours. Opener Josh Ransley did well making 43, five fours and one six. Captain Nic Piuselli 29 four fours and Jayden Wilton made 17 three fours. The main wicket takers were Josh Ransley 2-27 (7) and Brayden Hodge 2-28 (7). Special mention to Jye Lester who didn't take a wicket, but finished with 0/6 off six overs including four maidens. Gretna I lost its second match in a row, going down to Montagu Bay by four wickets. Having first hit, Gretna made 10/149 off 40.5 overs. Aaron Maddox has shown good form with the willow this season and made a handy 39 at number six, hitting six fours along the way. Jon Smith again got amongst the runs with 25 (three fours). Glenn Blackwell was next best with 11 (one four). In reply the home side got the runs, finishing 6/150 off 31 overs. Opening bowler Corey Ransley in his 150th match for Gretna I gave a good display of bowling, finishing with the good figures of 2-26 off 10 overs. Well done on this milestone Corey. Aaron Maddox took 2-53 (6) and spinner Craig Cunningham 1-42 (10). Mitchell Rice took 2-19 off five overs, Josh Walsh 2-39 (10) and the hat-trick kid from the Twenty20, Cody Morgan-Coleman, was again amongst the wickets taking 2-42 (10). In reply the Red Caps snuck home with just nine balls remaining, finishing 7/194 off 48.3 overs. Captain Chris Ashcroft continued with his good form, making 46 which included four fours. Nathan Heron made a very handy 29 at the end, hitting three fours while keeper Leigh Berry made 18 two fours and Cody Morgan-Coleman finished the job remaining 17no. The wicket-takers for Gretna were Mathew Burns who in strange circumstances took 3-22 off 10.2 overs. Burns and Sam Booth were unable to finish their overs and in turn confused their captain and the umpire completely. Aaron Browning took 2-22 (10) and Tom Allcock 1-10 off 1.3 overs. Chasing 92 to win at St Virgil's, Bothwell I got over the line against Derwent with the loss off seven wickets. Brad Eyles top-scored with 25no, Simon Eyles 16 and Craig Pursell 14. All the Bothwell bowlers played their part. Matthew Eyles did very well taking 4-20 off his 10 overs. Mathew Glover took 2-18 off 8, Brock Nichols 2-20 off 7.4 and Craig Pursell 2-30 (9). In the match between Bushy Park and Bagdad that was to be played at Bagdad, Bushy Park had to forfeit due to longtime player Mitchell Crosswell getting married the same day. Congratulations to the newlyweds Mitch and Emma. Yet to record a victory, Molesworth went down to Sandford at Sandford by six wickets. Batting first, the visitors got off to a good start with opener Jack Evans making a excellent 58 with seven fours and one six, Evans put on 66 with fellow opener Aaron Bradley 18 runs. Kam Mallinson in just his second match made 33 at first drop, hitting one four and three sixes. Down the order, Liam Triffitt hit three fours in his 15 runs. Molesworth was all out for 159 after 44.5 overs. In reply the home side finished 4/162 off 31.3 overs. Wicket-takers were Josh Nichols 2-30 (4) and captain Jason Mallinson 2-43 (10). Playing at Tynwald Park and with just nine players, New Norfolk lost its first match for the season. The Red Caps made 8 for 101 off 31.4 overs, with David Mitchlemore scoring 25 runs and Graeme Rowlands 14. Trent Smith and Brendan Skelly made 13 each. Wellington chased down the total off 38.1 overs for the loss of seven wickets. Spinner David Mitchelmore doubled up and took 2-28 off 9.1 overs and Jake Bearman took 2-33 (10). Paceman Graeme Rowlands tried his hardest and finished with tidy figures of 1-12 (10). Trent Smith 1-22 (8). Bothwell II registered its first win for the season with a big 116 run victory over St Aidan's at Bothwell. Winning the toss and batting first, the Bucks faced all their 50 overs, making the good total of 7/195. First drop Craig Davey top-scored with a well-made 77. Young Blake Eyles made a handy 26no and Mark Pearce 15. There were 45 sundries. In reply the visitors were bundled out for 79 off 23.1 overs thanks to all of Bothwell's bowlers. Mark Pearce 4-39 off 6 was the main wicket-taker. Rhys Franklin had good figures of 2-11 (6) as did Troy Branch 2-12 (5) while captain Peter Hansch took 2-17 (6). In all a very good first win for the Bucks.